When one UNM student says to another, “Meet me at the library,” they know exactly where they mean. The Zimmerman Library, “the campus heart,” is located east of the duck pond in the center of the university grounds. It houses collections for education, humanities, and social sciences, as well as the Government Documents Collection. We learned that the Zimmerman was originally built in 1938, and we had the privilege of touring, what it is now known as the West Wing first. The most astonishing room is the Anderson Reading Room, its very aura promoting supreme scholarly research and reflection. The murals and hand-carved furniture will literally take your breath away! As the university has grown, Zimmerman has become the largest of the four libraries. We now fast forward to the present where there have been many modernizations made to the original library. It now includes an Indigenous Nations Library Program and has a large number of study spaces, computers, and printing stations! 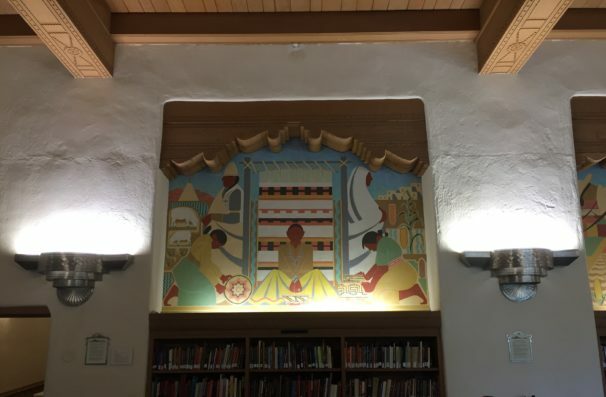 “The building itself is one of the finest examples of Spanish-Pueblo Revival in the Southwest,” as Martha Bedard, Dean, College of University Libraries & Learning Sciences states. In the Land of Enchantment, it is the epitome of entrancing, and it has truly captured my heart!! A huge thank you to Paulita Aguilar and Sarah Kostelecky! !